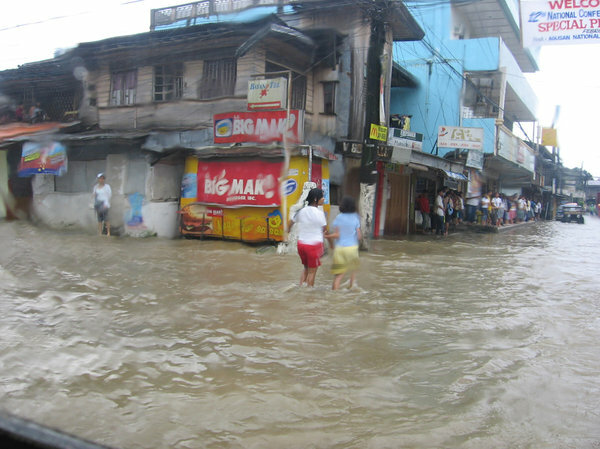 Butuan City, where I live, is a flood-prone area. 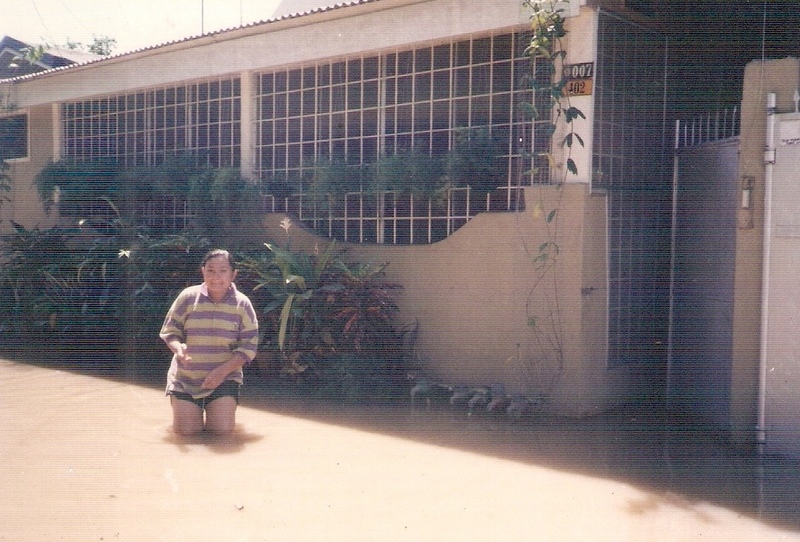 My mother and her sisters had told us a lot of flood stories. They lived near the river (we still do). When rainy season comes, the river swells and overflows. There was a time that they experienced flooding for a month. They traveled using bancas (small boat without the outrigger). 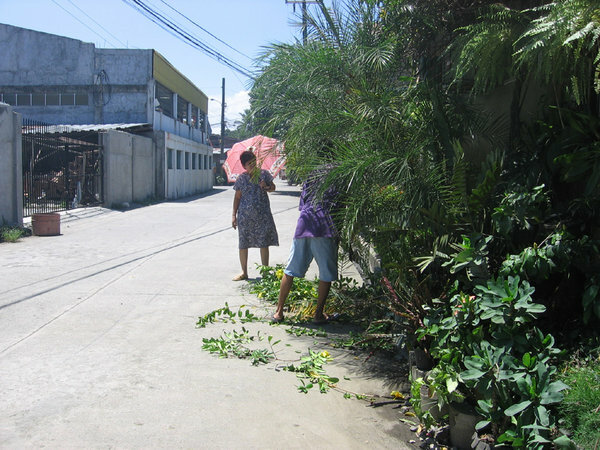 They had to live with my grandmother’s sister situated in a land with higher elevation but in a village far from the city. 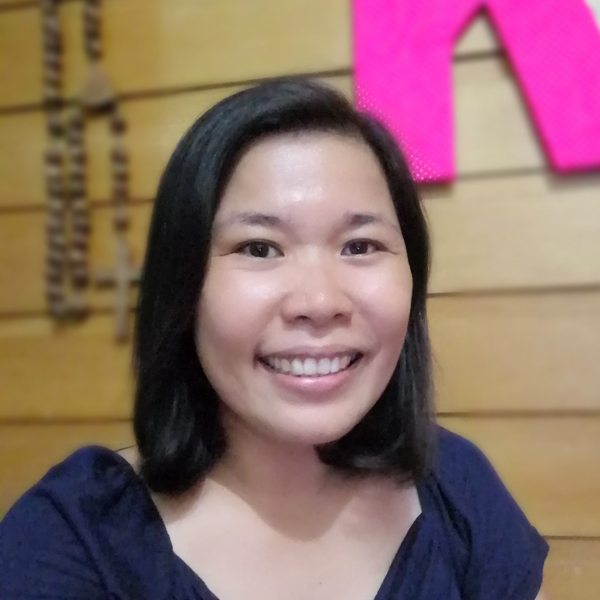 “One time, we were in a boat and the strong current knocked our boat in a nearby tree. Then, the centipedes in that tree fell on us. Imagine us wriggling ourselves in the small boat trying to brush off the insects”, she added. Centipede venom can be lethal, I learned. 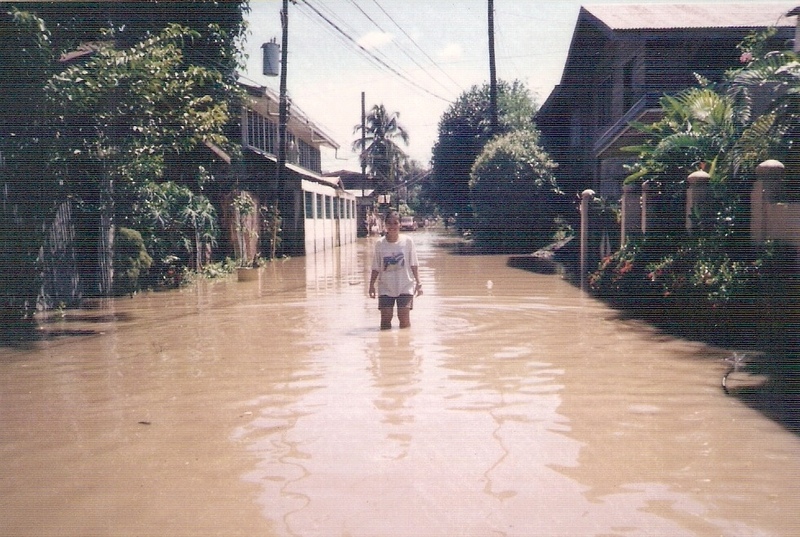 At a young age, I was fully aware of flooding in my city. I experienced it. 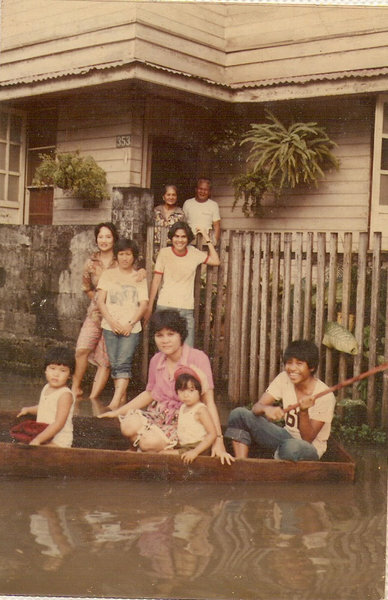 This is a photo of me in a banca with my cousins and aunt while my grandparents and other aunts looked on. I think this happened in 1979 or 1980. (Oh my! I am revealing my age. LOL!) I do not know if the water level already subsided. I can see that the water was just ankle-deep. I have not experienced flooding since this photo above. Not until 1999. So it was a novelty for my cousin and I to experience it again. As I look at the pictures now, one thing comes to mind: Leptospirosis. Leptospirosis (also known as Weil’s disease,) is a disease caused by infection with bacteria of the genus Leptospira that affects humans as well as other mammals, birds, amphibians, and reptiles… The infection is commonly transmitted to humans by allowing water that has been contaminated by animal urine to come in contact with unhealed breaks in the skin, the eyes, or with the mucous membranes. We are lucky we did not catch any disease by wading in the flood waters without boots! 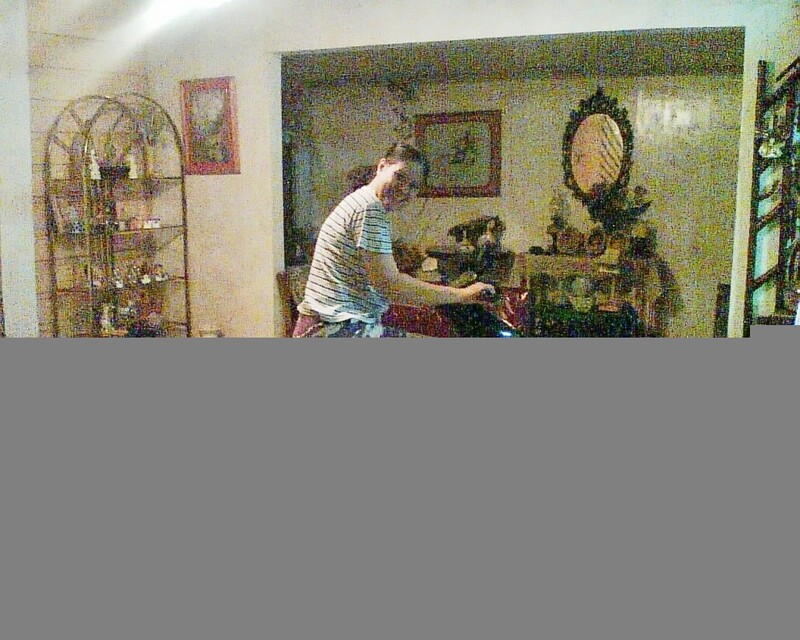 Inside our house, my father had to clean up the living room, dining room and kitchen area. 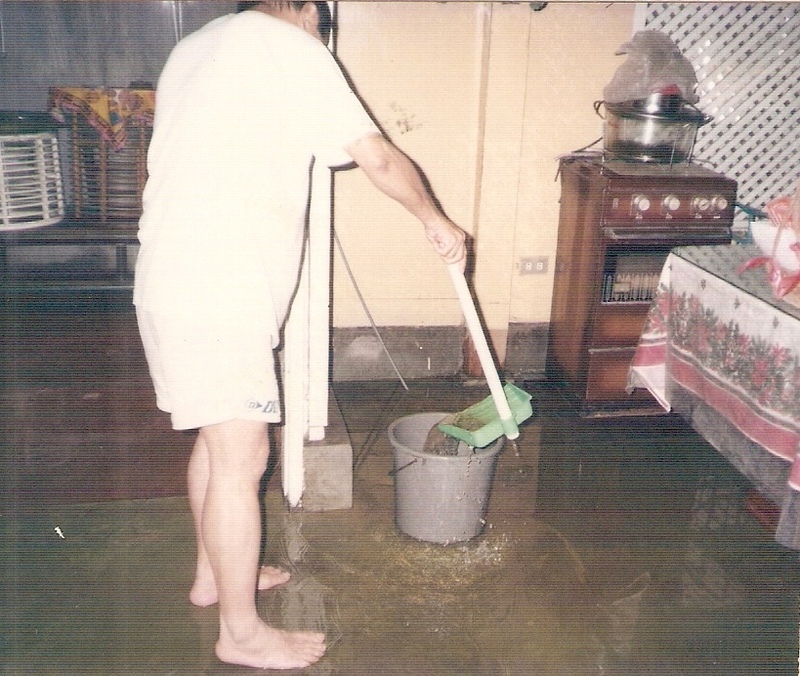 This flood incident prompted my parents to raise the floor level of the house to about an inch or two. 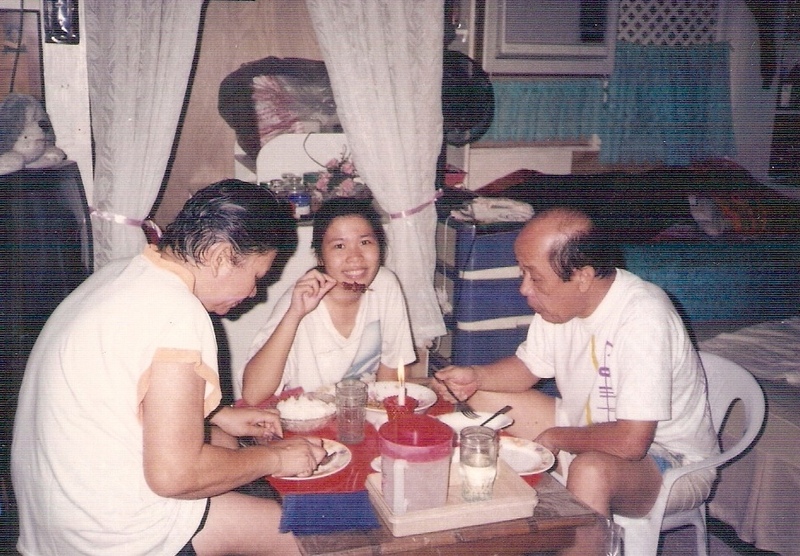 Thus, by 2006, when flooding occurred again, we were spared. The streets were flooded but our house was dry. 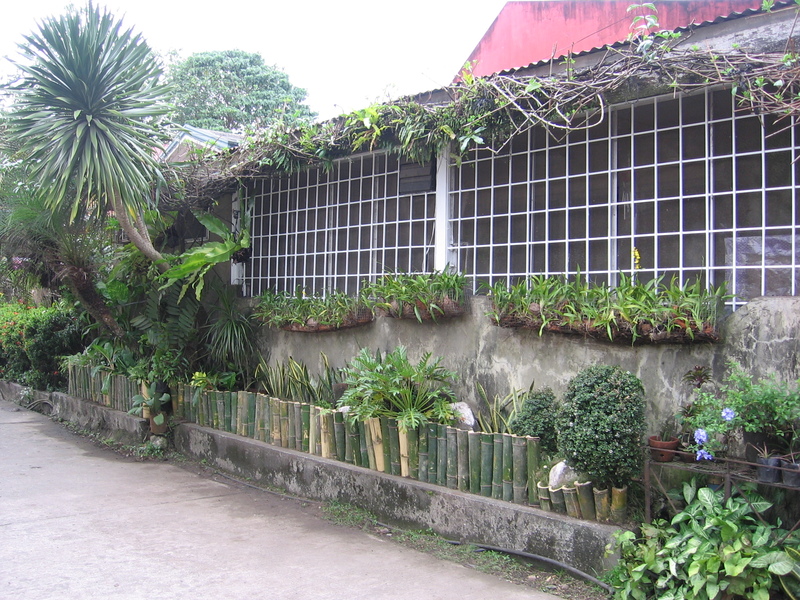 Fast forward to February 2011, flooding occurred again. 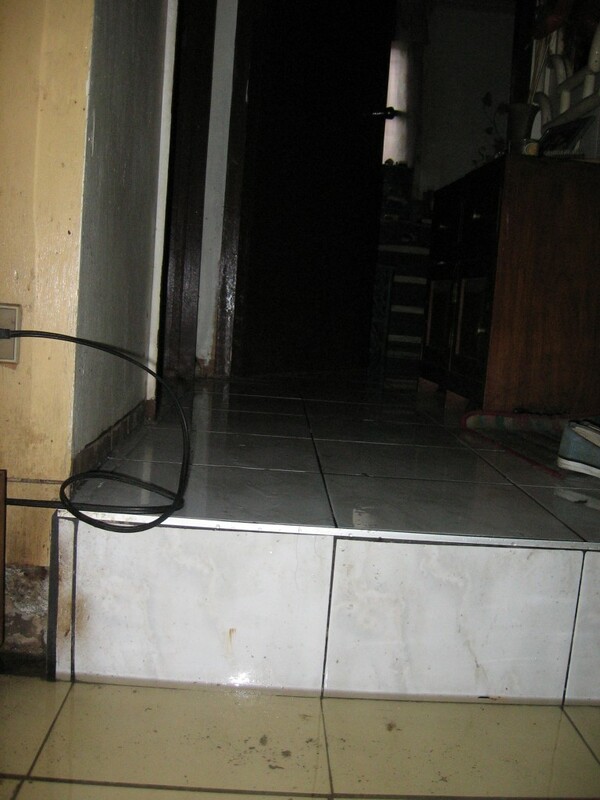 This time, it reached the living room, dining room and kitchen area. Bedroom and bathroom area were okay. Thank you, God. Thanks to my parents for being astute when it comes to design and engineering. Our no plan/no architect house is still a safe haven. Since the living room was flooded, we had to carry the sofa to a dry area. My aunt’s house was flooded, too. They have never experienced flooding before. 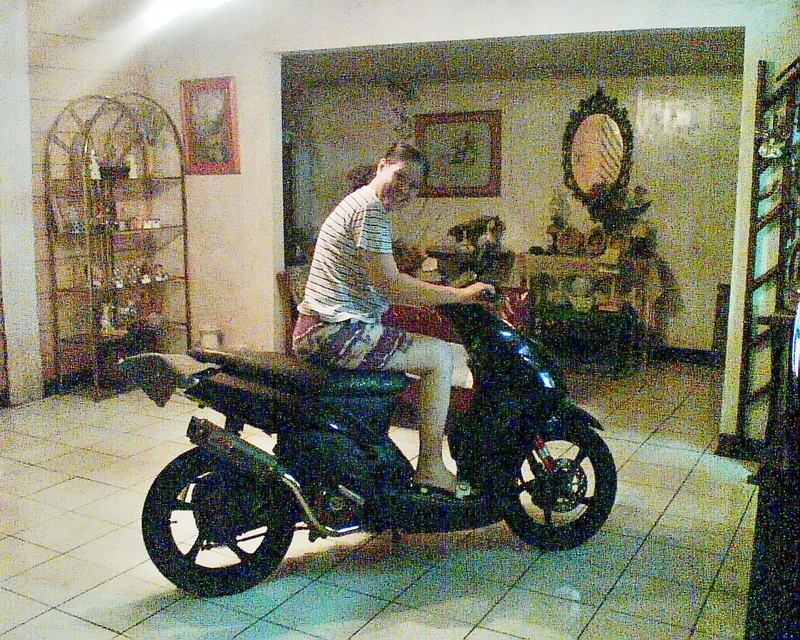 Since water in the garage area in my aunt’s house was more than a feet deep, my cousin’s motorcycle was parked in my emptied living room. Of course, someone took the opportunity to pose for a photo. No furniture in the house was damaged. Cleanup was tiring but I was happy I got a workout out of it and a cleaner house. Like most Filipinos I know, I have a penchant for posing for a photo to commemorate an event (even sad ones). 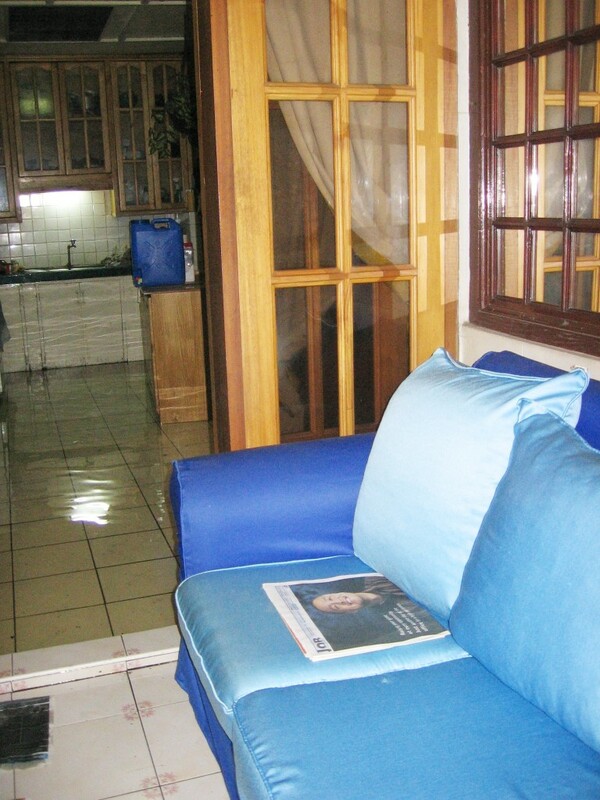 Since I have previous flood photos compiled, I thought of having my photo taken in my flooded living room. Since most people in the house were busy, there was no one to take my photo so I set the self-timer on a table. I quickly took my place in the middle of the living room. Alas! I slipped and landed on the flood waters face down. I tasted blood in my mouth. I realized that I chipped a tooth. Maybe it is Mother Nature’s way of kicking my behind for not taking the situation seriously. I could only imagine what my late father could have said if he had witnessed my silliness. I could have heard an earful from him.